The Mohawk Valley Region Path Through History begins with the Revolutionary War —the sites, events, and important figures related to the birth of a nation. The path to American Independence was heavily traversed through the beautiful vistas, pasture lands, and river valleys of the Mohawk Valley Region. This Region played a pivotal role in human settlement and the Revolutionary War, mainly due to its strategic, natural transportation route—the Mohawk River valley. 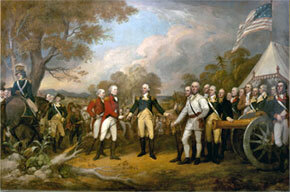 Of the nearly 300 battles fought during the Revolution, almost 100 were fought on New York soil. Those in the Mohawk Valley Region were amongst the most crucial. Travel back through history and visit the heritage sites that abound in this Region, serving as a reminder to current generations of the legendary places, great events, and heroic people who helped to shape the course of a nation, and the world. Walk in the footsteps of Patriots, Loyalists, and the Iroquois, by Palatine German, Dutch and Highland Scot settlers, and uncover the hardships and glories of these first New Yorkers.